Beware the Decemberists! The band's literate musings take audiences on a journey to the inner mind where ghosts lay in wait and shameful secrets are revealed for your listening pleasure. In literature, the term picaresque refers to a type of novel in which a likeable rogue goes on a long journey, meets colorful people and shamelessly engages in a series of dubious escapades. The most famous examples would be Miguel Cervantes' Don Quixote and Mark Twain's The Adventures of Huckleberry Finn. 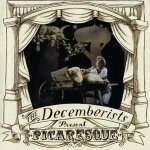 While the Decemberists' Picaresque lacks a central character, the songs themselves are largely told in the first person by the protagonist or an observer. The tunes take the listener on a time-shifting, stream-of-consciousness expedition into the imagination, peopled by infant monarchs, suicidal lovers, vengeful sailors, military wives and boy ghosts. As with classic picaresque tales, the art and purpose lie not with the narrative's resolution but in the trip itself. If this sounds like literary criticism, remember: this is a CD review. While the literary merits of the disc are important and will be discussed later, lead singer/guitarist/writer Colin Meloy's words here function as lyrics, not lyric poetry. The songs are sung and played, not recited, and the instrumental parts are essential in setting the mood, delineating character, and moving the story forward. For example, the deep rumble of drums underneath a strummed guitar opens "From My Own True Love (Lost at Sea)" and immediately lets the listener know something dark and foreboding has happened. Jenny Conlee's jaunty, slightly off-kilter accordion introduction to "The Mariner's Revenge Song" suggests the happy insanity of the sailor/narrator, and when the tar finds himself in the belly of a whale alone with his nemesis, you just know how much the mariner will delight in slowly torturing his enemy. The other band members include Ezra Holbrook on drums, Nate Query on accordion Chris Funk on theremin and pedal steel guitar. The Decemberists recorded the album in a former Baptist church in Portland, Oregon with producer Chris Walla (guitarist/keyboardist of Death Cab for Cutie). The vocals and instrumentation resonate and give the sound a spatial sensibility. One can hear the silence between the notes, whether it is a plucked guitar or Meloy taking a purposeful sigh between the verse and a chorus. Meloy sounds like a combination of the lead vocalists from the '80s' greatest alternative bands -- a bit of the lonely ache of R.E.M. 's Michael Stipe's murmuring atop the articulate desire of The Smith's Morrissey. The Northwestern American Meloy even sings with a bit of a Victorian British accent. Meloy and his mates give the songs a staged musical reading. They even dress up in different character costumes on the CD cover to match the protagonists of some of the more intriguing personalities such as the ghost, "Eli, The Barrow Boy", the male runaway streetwalkers "On the Bus Mall", and the trench coated female spy of "The Bagman's Gambit". The effect is one of musical theater. As mentioned previously, the lyrics have a distinct literary quality. Meloy is primarily a story teller. These songs tell tales and deftly employ the standard techniques of foreshadowing, suspense, and character driven plotlines. Meloy also uses quaint and old-fashioned words such as "palanquin", "quailed", "consumptive wretch" to set the scenes just right. He even makes allusions to other tunes to evoke moods and attitudes in language: "Matching blue raincoats" re: Leonard Cohen's "Famous Blue Raincoat", "We have power lines/in our bloodlines," re: Jimmy Webb's "Wichita Lineman", etc. and in music: i.e. the accompanying insistent bass and drum rhythms of "The Sporting Life" recall Iggy Pop's "Lust for Life" as ironic commentary. The Decemberist's version concerns an athlete sprawled on the ground, unwilling to get up and do anything, in contrast to Pop's try everything narrator. The Decemberist's latest release tells a number of different stories, but the focus is always on the narrator. We live in our minds, the songs suggest, so be careful. One never knows what's lurking inside.